Mastering Jazz Guitar---now available in standard notation only (no TAB!) ---is ideal for the serious student ready to take their playing to the next level. Expand the boundaries of your jazz guitar knowledge by learning chord/melody and improvisation skills with this exciting book---which picks up where the harmony and improvisation lessons in Intermediate Jazz Guitar leave off. In the chord-melody section, you will learn to play the harmony, melody, rhythm, and bass parts of any song simultaneously. Topics include integrating melody and harmony, developing bass lines, chord enhancement, quartal harmonies, and how to compose a guitar solo. Improvisation topics include playing over altered dominant chords, the diminished scale, the whole-tone scale, targeting the altered chords, revamping licks, modes of the minor scales, and more. 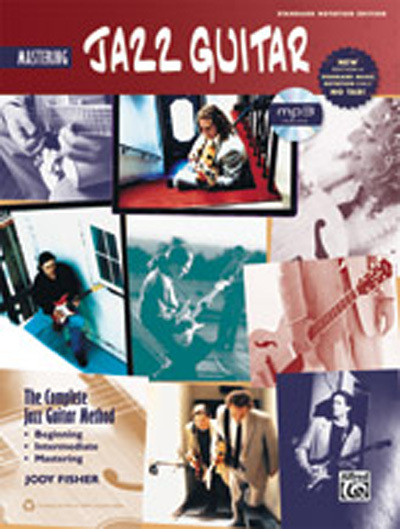 Loaded with easy-to-read scale diagrams, sample phrases, and arrangements of traditional melodies, this book is packed with essential information for jazz guitarists looking to master their craft.